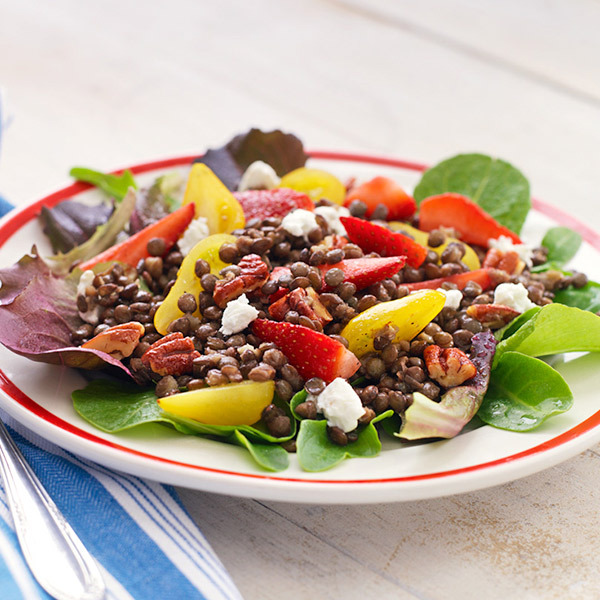 This Strawberry and Lentil Salad recipe combines the protein-packed legume and the antioxidant-rich fruit to create a tasty and nutritional salad. Lentils and strawberries are the stars of this colorful salad, but several other ingredients complete the flavorful dish, including goat cheese, yellow pear tomatoes, pecans and mixed greens. In large pot of boiling salted water, cook lentils until tender, about 25 minutes. Drain well. Meanwhile, in large bowl, whisk together vinegar and oil. Add hot lentils, tossing well to combine. Let cool to room temperature. Add strawberries, tomatoes, cheese and pecans, and salt and pepper to taste. Toss gently to combine. Serve salad on bed of greens. Tip: Small green-black lentils from France have a lovely peppery flavor, but you can also use regular lentils.